This tour was inspired by the popularity of our fun, fast-paced hour long Harbour Hopper tour. You will hear the highlights of our Harbour's history, while enjoying beautiful water views, in one convenient hour! This fully commentated tour provides some great history about Halifax, the founding, and some of our most notable moments in history such as the Halifax Explosion, our involvement with the infamous sinking of the Titanic and our harbour city's role in World Wars. Our iconic Mississippi-style sternwheeler is equipped with restrooms, a full service bar and snack options. The Harbour Queen offers an upper level with a covered roof and open sides, so you can enjoy the ocean breeze while being protected from the elements. The downstairs is wrapped in beautiful windows, and heated. 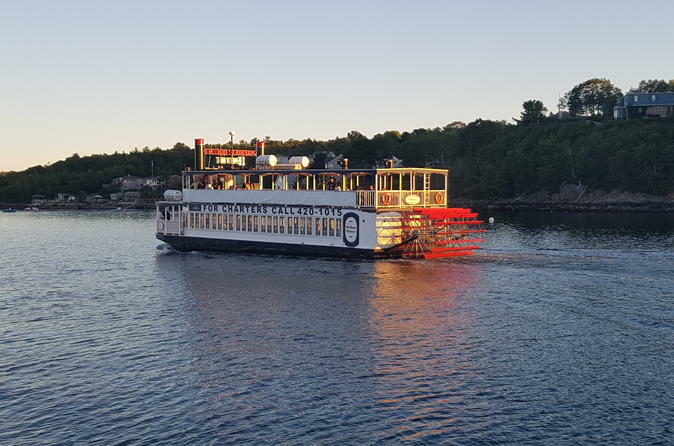 This Historic Harbour Cruise is a comfortable, relaxed way to experience Halifax from the water. Our tour begins boarding fifteen minutes prior to departure from the cable wharf directly beside the Halifax Ferry Terminal at 1751 Lower Water St. Depending on weather conditions and personal preference, you may choose either the top or lower level for seating. The upper level features a roof to keep sun off and open sides to enjoy the sea breeze. The lower level is fully enclosed, heated, and has a fully stocked bar as well as men's and women's washrooms. Your Deckhands will deliver the safety message and once that is delivered, the vessel will depart the wharf and the tour will begin! Your knowledgeable Deckhands are the tour guides for this cruise. You will hear about the history of Halifax from the location that is the main reason Nova Scotia's capital was built where it was: the Halifax Harbour. The highlights of the tour include an in depth story of the events leading up to the Halifax Explosion and the aftermath of that horrific event, this city's involvement in the tragedy of the Titanic's sinking, Halifax's formidable military defense system, and much more. At the conclusion of your one hour tour, you will return to the cable wharf. Staff are happy to answer additional questions, help to take pictures, and provide recommendations for further activities or destinations in the city. For anyone who has an interest in history or wants to learn more about Halifax with a smaller window of time available, this is the perfect tour for you.